15th of January, the Blockchain Foundry office came to existence. As expressed by Dan Wasyluk: “Four years after starting the Syscoin project, today is my first full time day working at BlockFoundry to improve the Syscoin protocol and build products on top of it.” With Syscoin up their sleeve, Blockchain Foundry aims to bring illumination to enterprises and institutions concerning their blockchain needs or ideas by providing experienced consultation and development services. This wasn’t the only organizational advancement taking place. To increase awareness around Syscoin, established community members decided to professionally manage funds donated by the community, and formed the SCMT (Syscoin Community Marketing Team). Comical, rogue (and in many opinions… awesome) video aside, high-ticket items including Lamborghinis and a house had indeed been listed on Blockmarket weeks prior, available for the world to see. The million dollar question those days, ‘’when Binance?’’, was finally answered on the 28th of March when Binance listed Syscoin. This increased market liquidity and further improved accessibility to buyers of Syscoin. Until 19th of April little was known by the community in regard to advancements to be introduced in Syscoin 3. This all changed during the first ever meetup in Vancouver hosted by the core developers of the protocol. The hard fork block number was announced, along with introductory explanations of Syscoin Assets, Z-DAG and a future release called Pangolin. Much anticipated, the 1st of May finally arrived. A new era for Syscoin and our community began. We watched with excitement as the first few masternodes went live. As the network gradually stabilized, we witnessed features like assets, masternodes and Z-DAG work together cohesively and tie-in with preexisting Syscoin smart-contracts like Aliases and Offers. Syscoin had officially evolved into a full fledged decentralised token issuance platform offering unprecedented performance and ease-of-use. With arrival of this new platform, SCMT stepped forward and introduced the weekly Syscoin update to further awareness of Syscoin current events within and outside of the community. Brad Hammerstron introduced an interesting and compelling set of analogies making it easy for people to understand how blockchains (including Syscoin, of course) could grow to replace conventional banks. Around this time, in line with the ideal of self-governance, the first proposals were issued and voted upon. This, together with the launch of syscoin.community and release of the long awaited Blockmarket Desktop 3.0, made for an exciting month. The 4th of July 2018 started off as any other day, and ended with Syscoin making history. Buy order fulfillment on Binance lit-off like a skyline fireworks display, filled the eyes of astounded onlookers, and culminated with a flashbang at the unprecedented height of ~96 BTC for 1 SYS. Meanwhile, our Core devs exercised due-diligence, suggesting exchanges temporarily halt trading while blocks were analyzed in case any cause might somehow be related to Syscoin’s blockchain. In the end, the blockchain was found to have been functioning as designed with all transactions legit. Binance explained they identified an issue with their own API and globally re-issued keys to all their API users. Active community members spent days on social media clarifying and elucidating the event, curtailing misconceptions of a “Syscoin blockchain hack”, correcting poor journalism, triggering article retractions, and teaching some members of the blockchain community how to read a block explorer as well as the benefits of SHA256 merge mining. Our Syscoin Community discussed various speculations due to the void of further information from Binance; perhaps Binance-hosted trading bots had gotten caught in a race condition, etc. Whatever the precise reason, it is a day well-remembered as Syscoin once again entered the hall of memes as “The Ole 96’er” (a throwback to comedy film “The Great Outdoors” starring John Candy and Dan Aykroyd). We topped-off the month receiving more positive news with the official Syscoin Developer portal going live, the first #Dantime in slack, the announcement of Whiteblock beginning third-party scientific testing of Syscoin Asset Platform, and CPSCoin (CoinPaymentsCoin) going live and successfully distributing the very first airdrop to Syscoin owners. July was a wild ride! During Syscoin’s birthday, a day of recognizing four years of successful development, the first mentions of Syscoin Platform 4 were made on twitter and within #Dantime. The goal of the fourth iteration was announced as introducing true enterprise scalability including expansion and enhancement of offchain aggregation solutions, together with smart-contract execution through Ethereum Virtual Machine, and sidechains. These new capabilities are currently being constructed according to use-cases gathered by our Core Developers from existing enterprises. Syscoin Platform 4 is expected, among many capabilities, to provide a fast, low-cost Ethereum smart-contract platform facilitating projects to move smart-contracts to Syscoin Platform from less viable platforms. An exciting month in which Jag and Doublesharp provided preliminary results on parallel execution of transaction signature verification, exhibiting an increased theoretical throughput of 200 million TPS, not counting network latency factors, apparently moving the protocol performance bottleneck from signature verification to network latency in what might well be another unprecedented achievement in the blockchain space. This further whet our community’s appetite for those anticipated Whiteblock test results. Meanwhile, A mythical and mysterious character easing hearts each Wednesday. J! What to say?! He let us in on details about development and in some way answered each and every query fired to him. Whoever he is, #Jtime was much appreciated. We tuned-in like kids waiting for a new episode of our favorite series. Around this time, SCMT started a community-led rebranding of Syscoin and an overhaul of Syscoin.org in concert with Brightscout, and with the help of a very generous donation of valued Community member Johnp who demonstrated his ideal of supporting what he believes in. Jag was flown to both Dubai and Mongolia to engage with government officials on blockchain solutions. This, and his respectful adherence to non-disclosure of details, further stirred the pot of positive conjecture among the community. During the same month, Syscoin Academy was launched by our much-appreciated community member Redrace. Lode also announced partnership with Blockchain Foundry, and explained their choice to bring the Lode & AGX token system to the Syscoin Platform due to its viability compared to other platforms, and expertise of the team. Syshub.org went live providing our masternode operators a much-needed convenient and secure web-based means of community participation including proposal voting, proposal submission, and a source for masternode-relevant news and statistics. Also, Syscoin’s much awaited new monthly roadmap format was first released in November, providing updates on an array of efforts across the Syscoin Community including those of Blockchain Foundry (within the bounds of NDA, of course). BlockchainSwaps.org alpha version went live, providing the public the first view of a blockchain marketplace web app, something anticipated since the first release of Blockmarket Desktop! The Lode & Syscoin AMA took place with great success and high participation on our Syscoin Subreddit. Many good questions and answers were provided. Lode’s token generation event took place in December — the silver vaulted by their users became officially backed by the AGX token, a Syscoin asset. Furthermore, Zontar released his longly anticipated SYSIO V1.0 dapp endpoints, providing developers a ready source of fresh Syscoin data in demand. More information on SYSIO can be found here. With the New Year approaching, we ended 2018 with a grand finale — the rebranding of Syscoin was completed by SCMT in cooperation with Brightscout. Our new website, full of the latest information and bearing professional design elements, was presented together with a brand new logo for the platform, followed by several publications covering the event. The year couldn’t have had a better ending! Throughput report by Whiteblock together with the release of the Z-DAG whitepaper. Open-sourcing of syscoin.js, indexer and its API. For more information see the roadmap at https://syscoin.org. We simply cannot close this year-in-review with anything other than a big “THANK YOU” to the entire community for past and continued ambassadorship, support given, leads provided, and developments made. 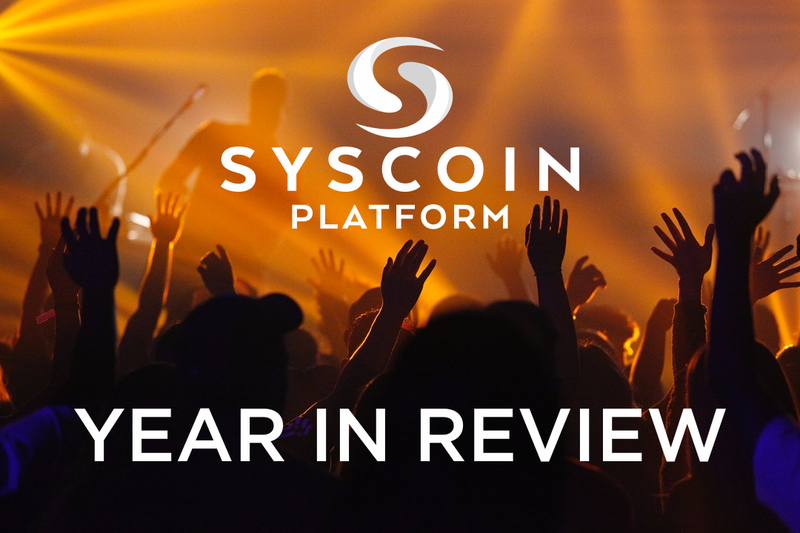 We look forward to rocking the blockchain space with all of you, and together, unleashing Syscoin into 2019!